In order to stay healthy, dogs need carbohydrates, fats, proteins, vitamins, minerals, and water in their balanced diet. Unfortunately, most dog foods do not provide these important nutrients. In fact, some pet foods contain meat and other ingredients unfit for animal consumption. CARNITINE an essential nutrient found in meat. Carnitine is especially important for the heart and vascular system. VITAMIN E has also been shown to be important for your dog?s health. 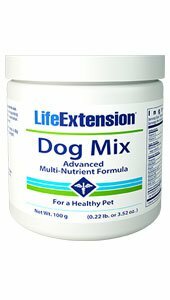 For dogs weighing 20-30 pounds, mix one scoop a day into your pet?s food or a treat. Adjust amount according to weight. WARNING: Consuming this product can expose you to lead, which is known to the State of California to cause birth defects or other reproductive harm. For more information go to www.P65Warnings.ca.gov/food. Required by the State of California proposition 65. Other Ingredients: flaxmeal, betaine anhydrous, L-carnitine L-tartrate, ascorbic acid, dicalcium phosphate, silica, d-alpha tocopheryl succinate, maltodextrin, rosemary extract, sage extract, thyme extract, riboflavin, alpha lipoic acid, Betatene® [beta-carotene with mixed carotenoids (alpha-carotene, lutein, zeaxanthin)], niacin, d-calcium pantothenate, pyridoxine HCl, thiamine HCl, tomato, folic acid, probiotics (L. acidophilus, L. plantarum, B. bifidum, B. lactis), methylcobalamin.